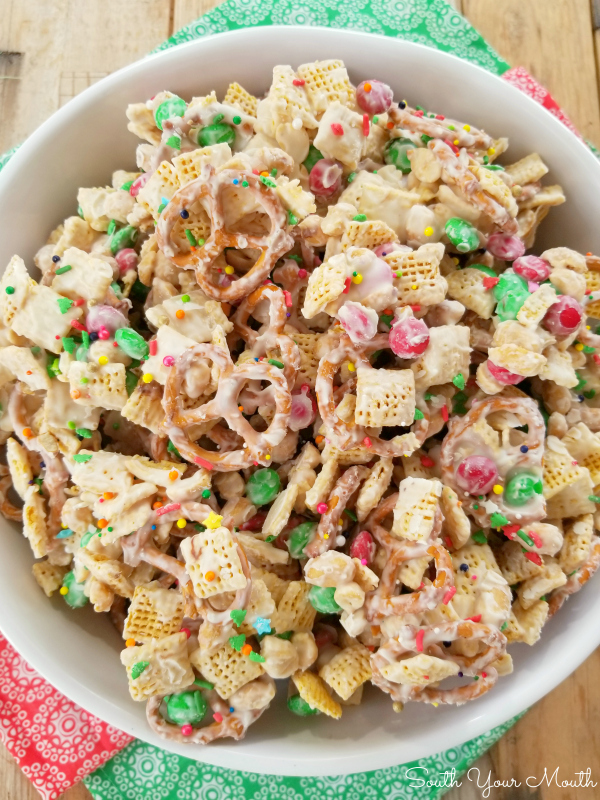 A sweet and salty snack mix made with chex cereal, pretzels, peanuts and M&M’s coated with white chocolate perfect for Christmas, other holidays or just for a sweet treat (also called Christmas Crack)! The first time I ever had this sweet and salty treat was when my neighbor, Terri, brought it to our house for a Christmas party we were hosting. Being the generous person she is, when it was time to pack up and head home, Terri left all the extra with me. I sampled some of it during the party but I didn’t really zero in on it that night because there was so much else to eat and because I was playing hostess. Well, the next day I nibbled on a hunk of it and after that, could NOT keep my hands out of the bowl! It’s addictive! Maybe that’s why some people call this Christmas Crack! Because it’s such a perfect recipe for any holiday (just use whichever holiday colored M&M’s) I wanted to make some a few months later for Easter. I couldn’t get in touch with Terri so I just googled the recipe, found one that looked good and made it. It was NOT the same as what Terri had made. Terri’s recipe is PERFECT. It has the scientifically correct proportion of sweet and salty and the perfect combination of textures for complete and total palatal bliss. I emailed Terri and asked for her recipe and she sent it to me. Then a year went by and I didn’t make it. When I did get ready to make it, I’d lost the recipe so I had to ask her for it again. I made it. It was perfect and awesome. Can you imagine how aggravated she was getting with me?? So I decided I would share the recipe here so I would always have it and never have to bug her for it again! And also because, now this is just my opinion, but I think this is THE BEST recipe for this treat. I’ve had several versions of it but I swear this one is best! I think using white chocolate chips instead of almond bark is one thing that sets this recipe apart. I find almond bark to be a bit waxy in comparison to the white chocolate chips (or, I should say, "white chips" as I've noticed they're called now - wonder when they stopped calling them chocolate?). 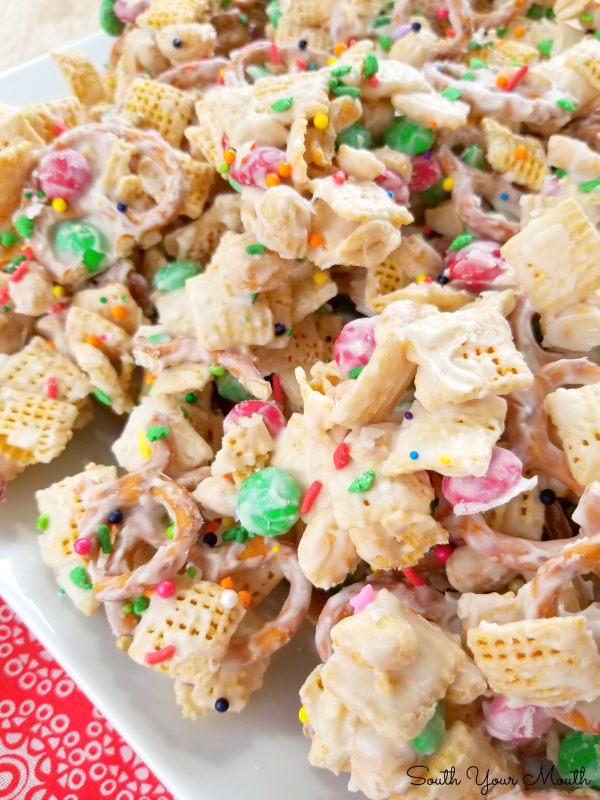 I've made this with Rice Chex and Cripix cereal and I think the Corn Chex is definitely the best! And I think you have to use dry roasted peanuts, not cocktail peanuts. I think all these little things I'm being nitpicky about are what make this recipe spectacular. 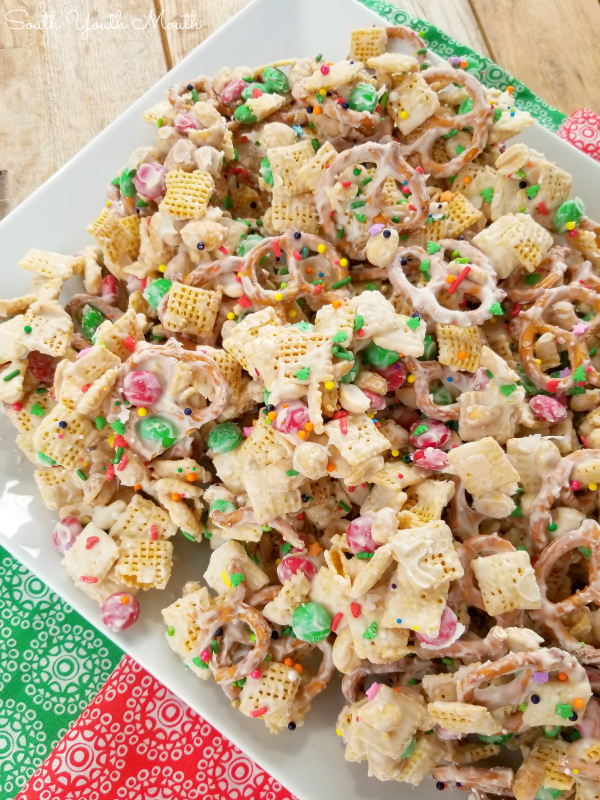 This goes by several different names: Christmas Crack, White Trash, White Chocolate Chex Mix and combinations of the same. I think Terri actually calls hers Christmas Crack but I’m not sure I love the idea of putting those two words together. I grew up in a small, rural town and actually knew quite a few crackheads… and… there was nothing merry and bright about their addiction. So, I just decided to call this White Chocolate Trash to be safe. Of course, I grew up knowing quite a bit of white trash too, so maybe that wasn’t the best choice either. HA! You can tailor this recipe for any holiday! 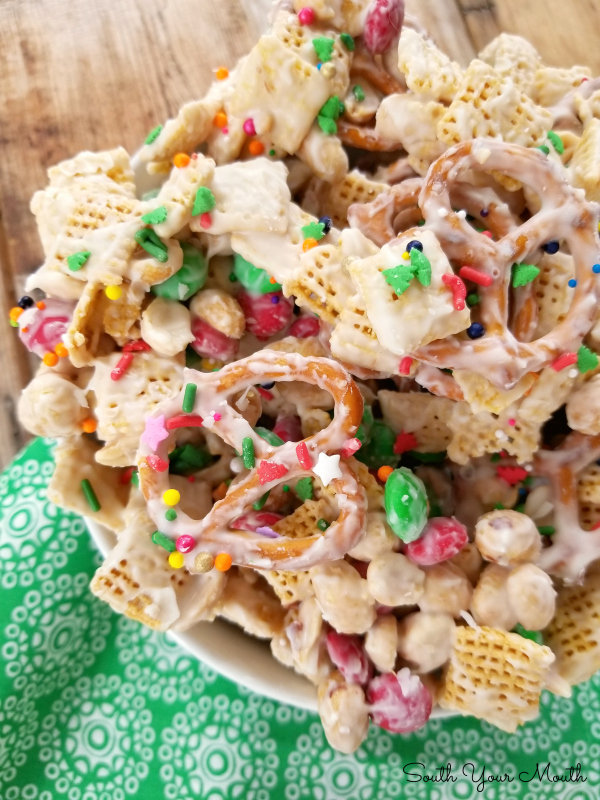 Just use M&M’s for whichever holiday is in season and coordinating sprinkles (the sprinkles are optional but fun for the kiddos). Or just make it with regular M&M’s if you’re making it for just any old regular day! Since it's Christmastime now, I made this batch with red and green holiday M&M's and THE CUTEST Christmas sprinkles. If you look closely at the sprinkles, there are teeniney Christmas trees and stars in the mix! I picked these up at Home Goods this weekend if anyone wants to look for them. Combine cereal, pretzels, peanuts and M&M’s in a very large bowl (I usually divide everything evenly between two bowls so I don’t make a mess stirring). Line two baking sheets with wax or parchment paper; set aside. Combine white chocolate chips and vegetable oil in a microwave-safe bowl then heat and stir at 30-second intervals until chocolate is melted. Pour melted chocolate over dry ingredients then gently fold until well combined. Spoon mixture onto baking sheets, spread to cover pans then add sprinkles on top. Cool in the refrigerator until set. Break cooled mixture into chunks then store in an air-tight container at room temperature. I've tried this several ways and I really, truly believe to make THE BEST batch you should use these exact ingredients: Corn Chex (not Rice or Wheat Chex or Crispix), dry roasted fully salted peanuts (not party or cocktail peanuts or low or no salt), white chocolate chips (not white almond bark). At some point they stopped calling them "white chocolate chips" and now, I see, they're all called "premium white morsels" or "white baking chips". Just look for the white morsels next to the chocolate chips! If you're looking for another fun sweet and savory snack, be sure to check out this recipe for Easy Homemade Caramel Corn! what brand white chips do you use? i have the darndest time melting white chocolate. can't wait to make this. Thank You! I use the nestle premier white morsels. If it starts to seize up on you when heating it, just add a little more vegetable oil. I've found that I have better luck when using a glass bowl. Hope that helps! great! that helps a lot! To "unknown"I gave up on the white chocolate chips because of the seizing, I now use the white chocolate discs from Michaels, they're Wilton. Melt a lot easier and in my opinion and people that have tasted my "Reindeer Mix' can't tell the difference. Adding oil to the chips is genius!! I tried making this a few years back with no success. The chis seized up so I declared it a disaster and threw it the trash (all of it!). Made this today and it came out perfectly. Heading to the gym now while it sets up so I can enjoy some later - guilt free. Thanks!!! Hey! Nothing to do with this awesome looking White Chocolate Trash recipe, but I was flipping through the Nov. 2018 Taste Of Home magazine that my MIL so graciously gives to me when she's done reading hers and I saw your photo with your Southern Shrimp & Grits! My initial thought was, "Hey, I know her!" Ha! 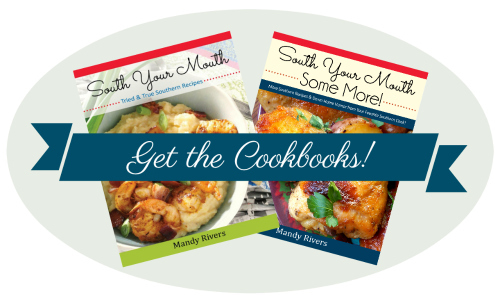 Congrats on getting your recipe in the magazine! Do you add in the sprinkles along with the other ingredients or sprinkle on top after mixing? I didn't know if the sprinkles would dissolve in the warm chocolate. LOVE this mix. We call it PMS Mix... Nothing better to soothe the savage beast. My son has a nut allergy so we omit the peanuts, but substitute with other nuts. We also add mini marshmallows for an added kick. 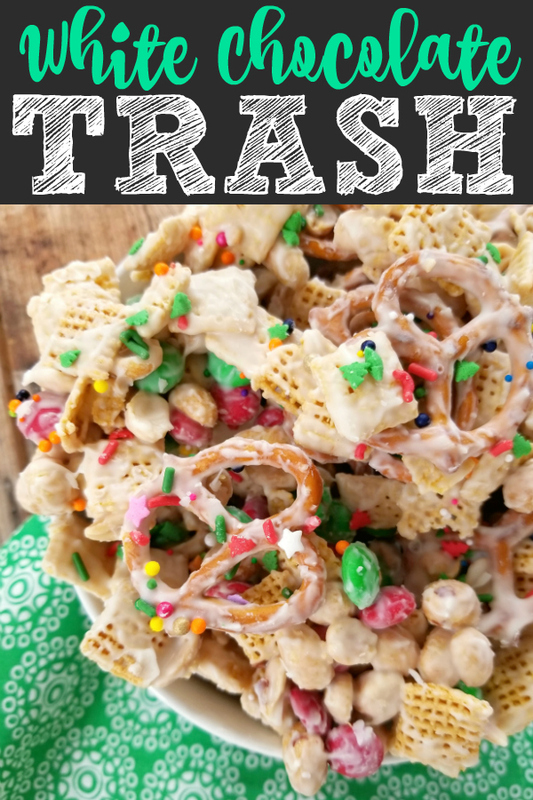 I make this every year and my secret ingredient (no substitutions-EVER) is Walmart Vanilla Almond Bark. I've tried others, but for some reason, this is the only one I use. It melts really well and tastes DELICIOUS! One brick of white chocolate makes about 1/2 of my biggest Tupperware bowl of mix. We also put mixed nuts (extra cashews please). This year I found tiny pretzel twists and ABC pretzels. One year we used dark chocolate M&M's which was a nice twist. Love it! Pretty much followed the recipe exactly with maybe a bit more white chocolate. First batch I used the hot water bath for melting with no difficulty. Second batch, I was in a hurry since the first batch somehow disappeared within 24 hours and microwaved....ended up with burnt chocolate (yuck) and had to redo. For the record, do NOT substitute the pretzel M&M candies. The store was out of the holiday ones and I snagged a bag of those. They are gross.